We're pleased to announce Amazon S3 Transfer Acceleration, a faster way to move data into your Amazon S3 bucket over the internet. Amazon S3 Transfer Acceleration is designed to maximize transfer speeds when you need to move data over long distances, for instance across countries or continents to your Amazon S3 bucket. It works by carrying HTTP and HTTPS traffic over a highly optimized network bridge that runs between the AWS Edge Location nearest to your clients and your Amazon S3 bucket. There are no gateway servers to manage, no firewalls to open, no special protocols or clients to integrate with, or upfront fees to pay. You simply change the S3 endpoint that your application uses to transfer data, and acceleration is automatically applied. When moving GBs or TBs of data over long distances, it can save hours (or even days) in transfer time. You can try the Transfer Acceleration speed comparison tool to get a preview of the performance benefits. Pricing for Amazon S3 Transfer Acceleration is simple, with no upfront costs or long-term commitments. You simply pay a low, per-GB rate for data transferred through the service. The pricing is designed to be risk free: if Amazon S3 Transfer Acceleration isn’t likely to make a difference in the speed of an upload (like when you upload data over the short distance from a client in Tokyo to an S3 bucket in Japan), you won’t be charged anything extra for that upload. For more information on pricing, see Amazon S3 pricing. To get started, you can enable the Amazon S3 Transfer Acceleration feature for your bucket by using the AWS Management Console, the APIs available through the AWS SDKs, or the AWS CLI. 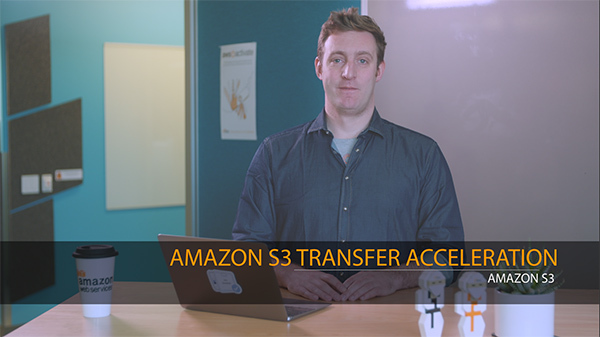 To learn more about Amazon S3 Transfer Acceleration, please refer to the Amazon S3 Developer Guide.